By the time I get home from work, I often don't feel like cooking a big meal. But if I've done some of the prep work in advance, it becomes really easy. This is pretty much my weekday plan. If I didn't do this, we would end up eating out a lot more often, or making frozen pizzas. When ever I grill chicken, I make a couple extra pieces so that I have leftovers for salads or sandwiches during the week. If I'm making a meat sauce for pasta, I like to double the meat and put half of it away to make a pizza or tacos later in the week. This is really the only way I will eat leftovers. If its the exact same meal again, its probably not going to happen, but as long as I use the leftovers to make a different meal, I'm happy again. This is what saves me during the week because if I can't make it in less than 30 minutes of prep work, it's probably not going to happen. I just don't have the time or the patience. What's your strategy for quick and easy weeknight cooking? For these Dijon chicken club sandwiches, I grilled the chicken on Sunday afternoon and wrapped up a couple pieces for sandwiches on Tuesday night. On Sunday, I served the chicken breasts with pasta salad and fruit for a barbecue; on Tuesday when I handed this sandwich to my husband, he had no idea it was really leftovers. Preheat a large skillet over medium high heat. Add bacon and cook until crispy. Drain on a paper towel. Remove bacon grease and wipe out pan with a paper towel, return pan to stove and reduce heat to medium. 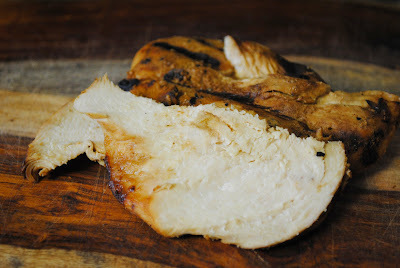 Thinly slice chicken breasts against the grain. Lightly butter one side of bread slices, spread mustard on non-buttered side of one piece of bread. 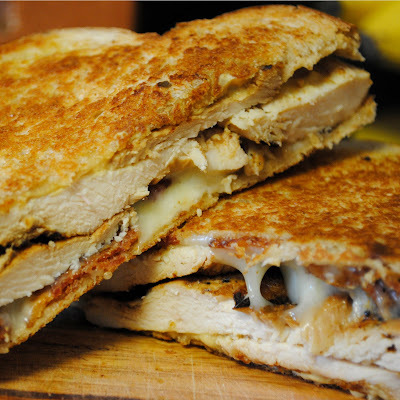 Add one slice of cheese, 2 slices of bacon, cut in half, and half the chicken to each. Top with remaining slice of bread and place buttered side down in the skillet. Cook 3-4 minutes until golden brown and flip. Cook about another 3 minutes until cheese is melted and sandwich is golden brown. Combine mustard, vinegar, and honey in a small bowl and whisk until smooth. Add spices and stir. Prepare chicken breasts and place in a large plastic storage bag. Pour marinade over the chicken, close bag and shake bag gently and squeeze to evenly coat chicken. Refrigerate one hour. Preheat grill, oil lightly and add chicken over medium heat. Cook 5-6 minutes and turn (if chicken sticks, give it another minute or so), cook about 5 minutes more until cooked through. Transfer to a plate and cover with foil for about 10 minutes to allow juices to redistribute. This sounds so yummy! 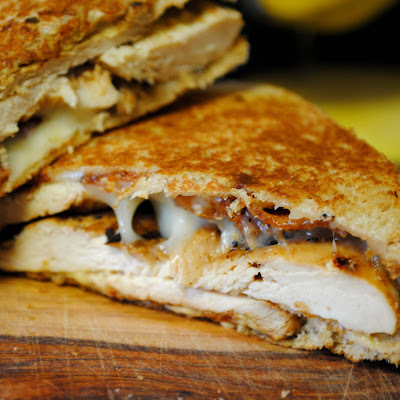 I'm making this for dinner tomorrow night. Love how simple and delicious this sounds! These look divine. I'm planning to use your marinade recipe this week. My husband would love the addition of bacon too!! These are tasty looking sandwiches! How many lbs of chicken breast? 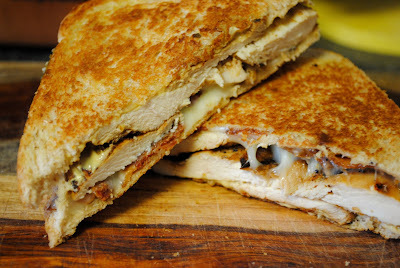 @gm - the marinade is enough for about 2 pounds of chicken, but I only used about 1/2 pound to make two sandwiches. We had these for dinner tonight and they were a huge hit! We used maple bacon, mmmm. Loved the marinade. I will be making these a lot in the future! Looks like a perfect week night meal. I always cook extra chicken for salads, pananis, pasta etc. It's the right (and smart) thing to do!! These tips of yours are actually great! Indeed, as one who is also very busy with work, I find myself often out to find something to eat. However, this should change and your advices are a great way to start. Thank you for sharing. By the way, this recipe is really good. I have tried this last weekend and it did not disappoint.